President-elect Park Geun-hye plans to create a super-ministry in charge of science, information and communications as the incoming leader seeks to promote innovation-based growth, the presidential transition committee announced Tuesday. Park will also revive the post of deputy prime minister of economy, to be taken on by the minister of strategy and finance, as the top control tower for coordinating economic policies. A new ministry of maritime affairs and fisheries will be reestablished while the trade section of the Ministry of Foreign Affairs and Trade will be merged into the Ministry of Knowledge Economy, the transition committee said. “The reorganization reflects President-elect Park Geun-hye’s policy philosophy and resolve for public safety and economic revival to usher in an era of people’s happiness,” Kim Yong-joon, committee chairman, said at a press conference. The bill on the restructuring will be submitted to the National Assembly during its extraordinary session on Feb. 24, officials said. Despite her conservative political perspective, the plan will enlarge the central government to a structure of 17 ministries, three lower-level ministries and 17 agencies, from the current 15 ministries, two lower ministries and 18 agencies. Officials said the overhaul is in line with Park’s vision to set up control towers to coordinate policies and reduce divisive, exclusive and overlapping operations among government organizations. “The reorganization was based on three principles: to minimize the change by only adjusting what absolutely must be changed; to realize the people’s safety and economic prosperity; and to emphasize professionalism and integration,” said Yoo Min-bong, head of the subcommittee for planning and coordination of state affairs. The biggest change will be the creation of a new ministry for science and information technology. “With the establishment of the new (tentatively named) Ministry of Future, Creation and Science, we will fortify the capacity of the government in discovering growth engines and creating new jobs,” Kim said. The organization will be responsible for devising long-term plans to promote research and innovation as a key aspect of Park’s vision for growth driven by creative sectors. It will also have a vice minister in charge of information and communications technology policies. There was speculation earlier of a separate ICT-related body. President Lee Myung-bak abolished the Science and Technology Ministry and the Information and Communications Ministry five years ago, merging their functions into other government agencies and committees. The Ministry of Public Administration and Security will be renamed the Ministry of Public Security and Administration to underscore the new government’s emphasis on law and order and public security. The post of special affairs minister for the president will be abolished. 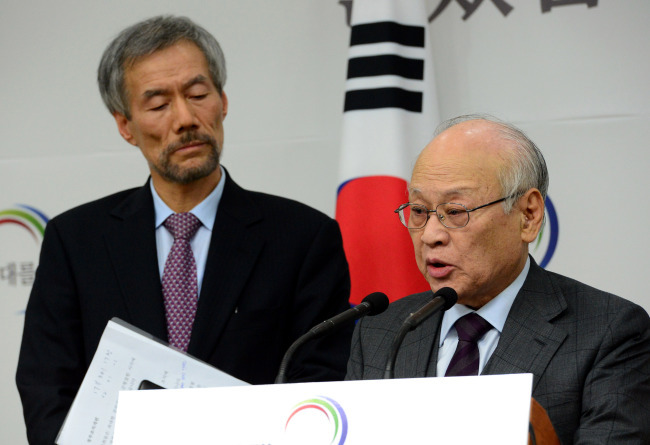 The Korea Food and Drug Administration currently belonging to the Ministry of Health and Welfare will be transferred to the Prime Minister’s Office, with an elevated status. Park had pledged to crack down on distribution of unsafe food, calling it one of the four social evils. The function of the Small and Medium Business Administration will be fortified by taking over some of the roles taken by the Ministry of Knowledge Economy. Park had highlighted her resolve to help small and medium-sized businesses by eliminating inconveniences and unfairness they face. Following the restructuring, each relevant organization will undergo name changes and their official English names will be announced later, Yoo said. 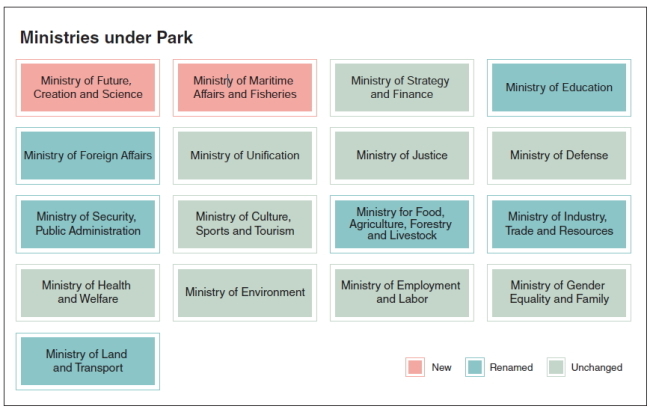 While they were excluded from the announcement, Park is also expected to announce the establishments of two other control towers for welfare and foreign affairs. Taking command of the state’s welfare policies is likely to be the Social Security Commission, which will prioritize the scores of welfare polices and administer their funding. To coordinate and supervise security affairs, the National Security Office is expected to be placed at Cheong Wa Dae. The routine government restructuring upon each administration change every five years has been discouraged by various pundits because of the resulting confusion, inefficiency and negative side effects -- such as government agencies devoting much time to defending their existence every five years. Under the single-term presidency of Korea, every ministry that underwent a reshuffle usually spends one year learning their new roles, and another year on developing new policies, leaving just three years to get down to business. “It is important for the government restructuring to be perceived as a process rather than a one-time outcome for a step-by-step and detailed road map (for the future),” said Dr. Park Young-won in his report published by the National Assembly Research Service. Park also suggested determining whether the new role should be better suited to a public or nongovernment body in drawing up new functions and analyzing whether the existing problems occur due to organizational or operational error. The last government reshuffle made in the U.S. was in 2002, when the Department of Homeland Security was established to enhance anti-terrorism efforts after the Sept. 11 attacks a year before. Japan has also maintained its administrative structure since its 2001 central government reform. Since 1992, Korea has gone through a total of eight government overhauls, with 15 cases of integration and five cases of new establishments. The only organizations that have maintained their original names since 1948 are the Ministry of Defense and the Ministry of Justice. Meanwhile, following the government reshuffle, positions of many high-ranking officials are likely to be downsized, sources said. Park had underscored her vision to expand the number of public servants with relevant experience to better respond to the people’s needs in the education, welfare and police sectors. 대통령직인수위원회는 내달 출범하는 `박근혜 정부'의 조직을 현행 15부2처18청에서 2개부(部) 늘린 17부3처17청으로 확정했다. 경제위기 극복을 위해 경제부총리제가 부활하고 미래창조과학부와 해양수산부가 신설됐다. 미래창조과학부에는 정보통신기술(ICT) 전담을 위한 차관제가 도입됐다. 지식경제부는 산업통상자원부로, 행정안전부는 안전행정부로 개편됐으며 특임 장관실은 폐지됐다. 김용준 인수위원장은 15일 오후 서울 삼청동 인수위 공동기자회견장에서 이 같은 내용의 정부조직개편안을 공식 발표했다. 기획재정부 장관이 겸하는 경제부총리는 경제부처 컨트롤타워 역할을 하게될 것 으로 예상된다. 보건복지부의 외청인 식품의약품안전청은 국무총리 소속의 식품의약품안전처로 이관됐다. 중소기업청의 기능이 강화돼 지식경제부가 갖고 있던 중견기업정책과 지역특화발전 기능이 중소기업청으로 옮겨갔다. 이같은 부처 신설과 업무조정에 따라 교육과학기술부는 교육부로, 국토해양부는 국토교통부로, 농림수산식품부는 농림축산부로 각각 명칭이 바뀌었다. 외교통상부도 통상교섭 기능을 산업통상자원부로 넘겨주게 됐다. 이번 미래창조과학부와 해양수산부 신설은 박근혜 대통령 당선인의 대선공약이다. 5년전 현 정부에 들어서면서 폐지된 과학기술부ㆍ해양수산부ㆍ정보통신부을 기 능을 되살리거나 강화함으로써 정부조직을 그 이전으로 환원시키는 의미가 있다. 또 경제부총리제를 부활하거나 식품의약품안전처와 안전행정부를 만든 것은 경제위기를 극복하고 국민안전을 강화하겠다는 박 당선인의 의지로 풀이된다. `박근혜 정부'가 보수에 기반하고 있지만, 시장기능에 모든 것을 맡기지 않고 정부의 권한과 책임이 강화된 `큰 정부' 기조를 채택했다는 점도 주목된다.